Does anyone remember the sound that kraft mac used to make when you stirred it all around or took a bite? The squishy sound that you knew meant you were about to eat macaroni? This butternut mac is pretty much identical to the old stuff in a box that we all loved when we were 5… or 20 .. or you know, whatever. Only difference… you actually feel good eating it. Preheat your oven to 400 and prepare your butternut squash. I usually buy a whole one, peel it, and cut it into chunks, roast it all at the same time, and freeze what I have left over, but you can also buy it pre-packaged and already squared if you’re low on time. Roast the squash, coated well and evenly in olive oil, for around 30-40 minutes on 425, in an uncovered dish, or on a cookie sheet with some foil. Toss occasionally to ensure that it doesn’t burn. Make sure you get it all coated in oil, or it will stick and burn. And that would make you sad .. I hope. Heating Earth balance over low-medium heat. In a bowl, whisk together milk and cornstarch (or flour) until clumps are gone. Add into pot and whisk. Stir in remaining ingredients (nutritional yeast, Dijon, garlic, S & P) and whisk over low heat until thickened (about 5-7 minutes or so). Remove and set aside. Cook your pasta next. This recipe makes roughly enough to cover 4 servings. In a processor, blend 1 cup of roasted squash ( shred it with a fork first ) until smooth. Mix the cheese sauce with the butternut squash in a pan, and add your drained, cooked noodles, as well as any mix-ins you want to add. Stir and let heat through, until you get a creamy texture and everything is blended well. 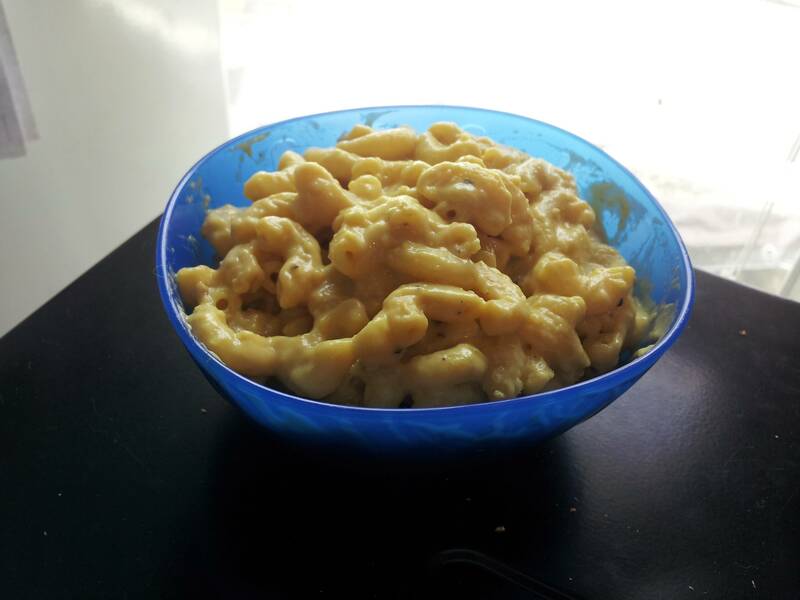 This entry was posted in Recipes and tagged almond milk, butternut squash, cornstarch, garlic powder, macaroni, margarine, mustard, nutritional yeast, olive oil.